The fog has cleared and the sun is above. a day without rest for the mourning dove. Through the desperate battle, my banner. There are only 3 major alliances worth considering at this point, so I've taken the liberty of ignoring the rest. The advent of arties requires a little more analysis than I have included in previous reports. 1) [55 players, 85% chance to win] the Slackers (name of the week in the Southeast, though with tendrils in the Southwest and Northeast, currently labeled "IAS," "Invasion of the Arty-Snatchers"). 3) [55 players, 7% chance to win] PVLN in the Southwest and Northwest. Here's the data I am looking at. Unlike in previous reports, I am not reporting this to you objectively. My thoughts are included. I considered three major factors: army strengths (gauged through raid and attack), arty control (because, *gasp*, I have a treasury and can see who owns artifacts), and development (capital and hammer development is a huge factor in progressing from here to victory). This is damning. Even combined, the other major alliances have fallen significantly behind. This speaks to existing troopcounts as well as the potential to queue future troops. Although nothing has really happened yet this server defensively, I don't think there's much to say about this besides the obvious. Slackers leads, and the other alliances, combined, might maybe stand a chance. Sure looks like Slackers have the most powerful forces, though. Note: I consider large artifacts to be the least valuable type of artifact. 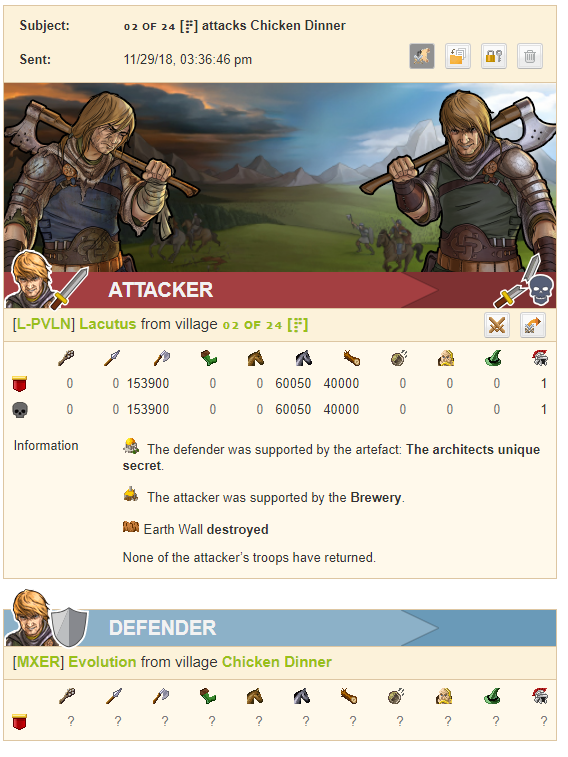 They're annoying to move and hard to defend, and the common player needs artifact bonuses in a single village, not across their account. A large in certain categories, such as a wall, is a must, but too many larges is a drain on defense. Smalls are infinitely more valuable, IMO. Narrative: I think that Slackers picked up too many larges, and even though they have the most value (obviously), I'm not sure they'll be able to defend all that. Slackers has the unique wall, which is probably the only advantage they need to secure a win given their other advantages. They also have the hammers to really go after the UT and UD held by adversaries. I think PVLN has the best mix of smalls (change my mind), and has the Unique Diet. I'm bad at this game, though, so if people want to dispute my relative valuations here, by all means. This is a flawed measure, obviously, but if you don't have 950 pop on your 15c, it's virtually impossible for you to be all 17's at this point. Note also that this count is 15c capitals with 950+ pop only. In general, villages over 1k pop belonging to known hammer accounts also strongly favored Slackers when I looked through the list, although I didn't keep a strict count of potential EGH's. So that's not listed, but I will say from looking through the top 10 pages of villages on the server that I expect great things from Slackers EGH's. In any case, the narrative is pretty clear: PVLN and CNIPS have some quality (a bunch of the accounts I looked at are set up quite well), CNIPS also has quantity (most development), but slackers has quantity of quality (by far the most well-set-up accounts and huge advantage in average player development). 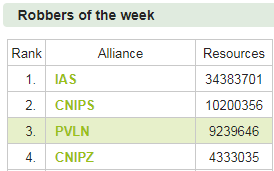 In this category, Slackers is the clear #1, followed by CNIPS and PVLN. Oh, and if you were wondering, pop for player #100 is 4,474, and for player #50 is 5,858. 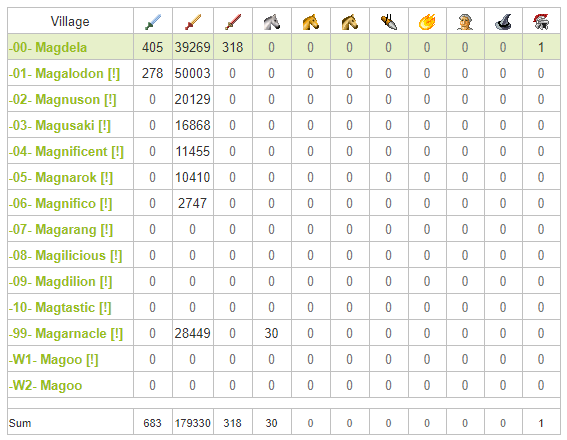 The average slackers player would rank 45th this server, on a server with only 388 active accounts. That's a heavy, heavy advantage. For the record, Slackers have 34 of the top 100 players, the same as last time. PVLN have 25, which is up 1. CNIPS/CNIPZ has 36, which is up 4. This server has a bunch of heavy gold users, almost entirely limited to Slackers. This game has increasingly become pay-to-win, and it shows. The "top 100" stat is basically meaningless, as the difference between the #1 player and buyer of artworks, Palpatine (Slackers), who has 21 villages and 16,684 development alone, and the #10 player, Hoodlums (Slackers), who has 9,960 development and 14 villages, is a whopping 7 villages and 6,724 development. That difference is more significant than the difference between the #10 player (Hoodlums), and the #100 player, XCaliber (PVLN), who has 4,474 development and 7 villages. (Difference of just 5,486 development.) It's too soon for autopsies of TG, I think, and maybe designing the game where heavy gold use results in such a huge advantage is a good business strategy, but it's certainly not conducive to maintaining a large player base. Good morning campers, I'm your uncle Ernie, and I welcome you to Travian US3. The server with the difference, never mind the weather, when you come to s3, the holiday's foreverrrrr! What's that I smell? It's kind of an old, musty smell, like some relic of a bygone age. Where is that coming from? It smells like it's coming from around the corner. I figured it out! It's artifacts, and they're coming soon to a theater near you. Buy a ticket now, or risk getting one of those garbage seats in the back -- like, around 146|160. Yes, 146|160 is a garbage seat in the back of the theater. Hear that kids? Anyone who settles 146|160 is bad and should feel bad. No no, don't bother looking up those coords, just believe me on this one, kk? Hark! An unstoppable force! An uncontested power! No one wants to fight it, and so, no one does. #WeQuilt essentially has free reign over its quad and a small part of the SW border as well; its lack of troop death is frightening... not only is it the most developed, its troop count graphs must be going up, up, ... up. (No attack points, no def points...) Is your WW level 100 yet? A lopsided contest, an unfair competition. The server's villains using 802 for target practice have held its development down so hard that #WeKnit climbs faster in total with half the players. An eerily silent hodgepodge. CN has largely vanished from the quad, according to the gettermap, as a few of its NW players switched to #WeKnit. However, PVLN, #WeKnit, and TIPS remain hopelessly tangled in this quadrant. However, surprisingly few skirmishes have occurred. Some have, but still, very very few. PVLN has focused on the SW, and TIPS has focused on the NE, leaving the mostly late-starters in #WeKnit to peaceably sim. I have remained silent on the TIPS/CN conflict, but the statistics increasingly favor TIPS. However, CN still maintains areas on the gettermap completely separate from any TIPS players -- TIPS is more centered and CN has some strong outlying capital clusters. For this reason, CN looks like it can put up EGH's and hold arties, but I don't know where it will build a wonder. Conversely, I don't know where TIPS will build EGHs. This contest yet prevents the NE bloc from being dominant over PVLN or looking like an obstacle for the server winners in the SE. 2) #WeQuilt takes the most important endgame arties, grabbing the most/best trainers and walls, plus probably some speeds. 3) TIPS takes more arties than it can possibly hold, and #WeQuilt takes them from them. 5) PVLN takes more arties than it can possible hold, and #WeQuilt takes them from them. Going to arrange it a little differently this time around. So, bear with me. Unless you are not a bear. In that case, human with me. That's super boring, though, so I hope you're a bear. I'm not saying that I prefer bears to humans, but I am saying that bears > humans. 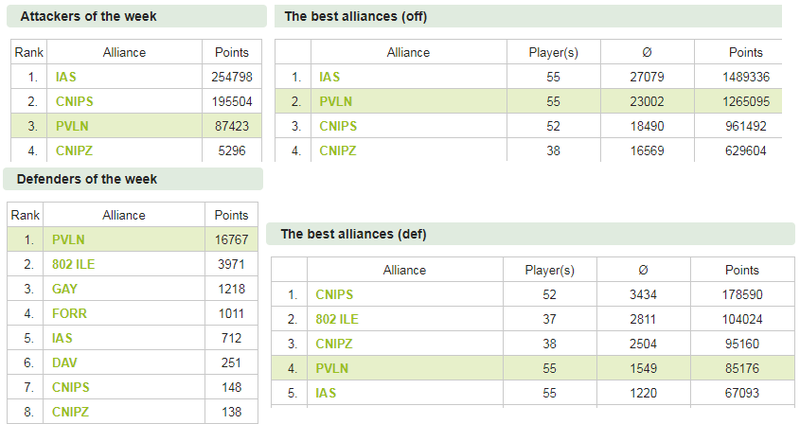 Anyway, last time I used the top 10 alliances by straight up rank, this time let's stick to the top 7. Past that there isn't really anything happening. This is a juggernaut. Preformed team has a full third of the top 100 players, combined with impressive raid and climb. I checked, and the climb per person here is the best. Raid per person is still very very good. And unlike 2 of the Tier II alliances, they control their own quad, and appear to have sufficient far-out croppers to be building some nice surprise EGH's. But also, that one time another alliance tried something on them so far, they rebuffed the attempt with ease. This isn't so much "the team to beat" as "the team that will win unless they mess up." 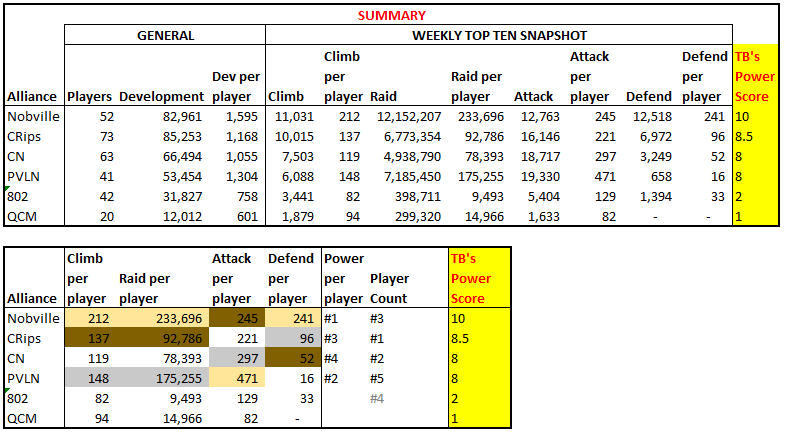 Anyway, if you go on the weekly top 10 and divide their raid, climb, attack, or def points at any given time by their number of players, they're always first or second, and sometimes first by miles. This is also a hugglenaut. In terms of player count and development, this looks strong. However, if you do the same thing I suggested above (divide the weekly raid by player, weekly attack by player, etc. ), you are looking at a much lower quality-per-player alliance. Despite having 11 players more than Nobville, at time of writing, the total development of this alliance is only about 2k greater than that of Nobville. And like I mentioned last time, some of the capital locations in this alliance are super questionable. Basically, I do think that this is the stronger alliance in the NE now, but its potential to put up EGH's given the competition from CN and given the location of the caps of its strongest players seems questionable to me. This is certainly strong enough to compete, but without EGH potential, I don't think it can really ask a question of Nobville. There's a lot of propaganda coming from the CRips about the leadership of this alliance and their likability and whatnot, but I have not had any negative experiences with them, yet. Also, their raid per player, attack per player looks better than the CRips. It looks like they have at least a couple good EGH locations locked out too, but I don't see a WW location for them. Also, their development is seriously lacking and I see them being eclipsed in that regard by CRips. As time passes, that hugglenaut will be too big for them, I think. However, if you just straight look at raid per player, attack per player, and the player attrition across CN vs CRips, there might be an argument that these guys come out on top. With no significant reports between them yet, you're really asking a magic 8 ball. Without some kind of resolution in the NE, though, I don't see how the quad can compete in the WW race. Now everything I think here is obviously biased, but my chosen statistics are not. Top raid, top attack on a per-person basis, some strong looking capitals, and good climb per person as well. However, while I pointed to player attrition in CRips and CN, I think it's misleading here; CN and CRips both ran multiple wings with screening, while PVLN preferred to screen players to a greater extent before they entered the alliance. As a result, CN and CRips are essentially in their "trim down" phase, while PVLN is still in its "stock up" phase. This alliance is competing with Nobville on quality with some success. However, overall, ranks 4th among the top 4 alliances in development. Without more development and players, it is very difficult to see how it could challenge Nobville. (Again, not that I won't try!) Adding to this difficulty is the mixed successes it has seen in in-quad operations. It has put up the first quad-demolition reports, showing a willingness to use and lose troops in operations that CN and CRips have not, but it has also blundered into some expensive losses against Nobville in the SW. Hopefully, its blundering leader has learned something from the experience. Anyway, the advantage it has over CN/CR despite its lower player count and dev is quad control. CN and CR are competing for the same space, while Nobville and PVLN have a large area essentially under their own control, allowing for EGH development. There once was an alliance known as Ghost... But seriously, credit where credit is due: these guys somehow manage to have a net positive raid per week total. Not sure how they did it tbh, given how much some have made off with. Is this a rumble in the NW? Respectable effort and goal from a respectable and well-known leader. We can only watch and see if it pans out, I suppose. CRips and CN have tentacles in the NW, and PVLN has a lot of development there. Hard to see how a ragtag bunch can assert any kind of control, but I've heard boxy can work wonders teaching new players. And I did look -- a bunch of them bothered to settle reasonable cap locations after he swept them up from Ghost and elsewhere. So.... maybe? I am always confused when I see players with multiple villages who have yet to take a cropper, of which there are a few here. This team does look to be going for quality over quantity, and it will be interesting to see how the NE quad plays out given that this looks to be the most competitive quad, and since TIPS has villages in the SE and FrsWheel has villages in the NE. Included in the NW because they do have an NW wing and players in the NW in their other wings. From what the NE looks like, I think they're at a disadvantage. They're looking pretty strong overall, though, so I hesitate to count them out. Caps look pretty good. There are several players in here who look good, but the vast majority of this alliance looks a little like the Great Plains, if you catch my drift. To be fair, there are several players in here who look very good. But again, the rest of the alliance could be Iowa as far as I can tell. Quality over quantity. Obviously, anything I say here is biased, but if you look at caps and development per person, raid per person, etc., I'm sure you'll agree. There really aren't enough players here to be a contender with the alliances in the other quads, though. Enough to inflict a ton of damage, absolutely, but probably not enough to contend. I look forward to proving me wrong about that last bit, though. Post was edited 12 times, last by The Burninator: Day 105 Update ( Aug 1st 2018 ). Gotta be talented to look after 2 WW's simultaneously. Or crazy... Crazy seems more like it. Storeythor,most offensive/defensive account holder on the server. He's a nut and the more the odds are stacked against him, the better he seems to come out of it. I spawned in the wrong quad. Oh well. For the slower minds among us, would you explain the reference? I don't get this at all :p.
I am sitting here trying to remember the name of the movie and I refuse to look it up. You did a nice job with the analysis, is what he is trying to say, I think. The movie was "Be Cool", sequel to "Get Shorty"..
Elliot Wilhelm : Whoo! Scorchin'! Elliot Wilhelm : Like that? It has come to my attention that some alliances feel slighted because they were left over. Can we get a fix on this? I mean I need to know who is who. Well aside from odinloki. He is always easy to spot. You will notice me. I will be leading the alliance that jumps up to #5+!!! I always love these analyses because the folks who conduct them are SOCLOSE to understanding our freak-show methods but not quite there. Oh, well. Great analysis, learned a bit about my neighbors. Keep up the great work. Well aside from odinloki. He is always easy to spot. Is it the red patch..? Well, if you consider the source, and actually ask him if he's any good at this game then you would understand how much of a compliment it is to tell him he's close..!! I appreciate this message. I've worked hard at hiding odinloki, and I've done as well a job at that as I have with anything this round so far. Oops. I do feel slighted, even though we are in an alliance with one member and haven't done anything but screw up. Tell me, did you also spawn on this server? If so, why haven't you IGM'd me yet? And sorry for not responding before -- I was deciding how to deal with the question about a "fix" :p.
and haven't done anything but screw up. I think that's our signature move..
Don't worry. We are currently recruiting spies. Only the best of the best Spies though. I had to reject Odin already. All of the other talk and these familiar names has scared the southeast. We have decided to become CN's third wing. We are now known as CN3. We believe that this meta will allow us to win the server - it was the only way. I give you all the infos. CN3 is weak and lacks leadership. I understand that my presence in the NE has scared you roundly. You have made the right decision, Mr. Splat.